With an estimated 20,000 to 30,000 financial planning practitioners in Singapore, it’s common for Singaporeans to find themselves being approached by multiple agents hoping to sell them health insurance products. This process usually starts right after you land your first job. You find yourself surrounded by peers discussing financial matters, and of course some of your friends have chosen to pursue a career in the insurance industry as financial planners. While health insurance is an important component of successful financial planning, it is possible that people may find themselves overspending on it, particularly if they fall into the trap of wanting to cover themselves for just about everything under the sun. In this article, we will share some simple ways that you can prevent yourself from overspending on health insurance. The first step would be to understand the various types of health insurances that are available in Singapore. It’s easy to get confused over different policies because insurance companies will have different names for them. Namely, there are 5 main types of health insurances in Singapore. They are basic hospitalisation medical insurance plan (sometimes also known as medical expense insurance), hospital cash insurance, critical illness insurance, disability income insurance and long-term care insurance. Below is an extract from the Life Insurance Association’s Guide to Health Insurance for what each type of health insurance covers you for. The next step is to understand our nation’s health insurance policies. MediShield Life was introduced as the country’s basic hospitalisation medical insurance plan. Coverage for MediShield Life applies to all Singaporeans and PRs, regardless of their age or pre-existing illnesses. That means even the elderly, those with disabilities, people with special needs, and people with existing health problems are all automatically covered by MediShield Life. For those who are 40 and above, you will be automatically enrolled under ElderShield at 40 years old, unless you opt out. ElderShield is a severe disability insurance scheme to help those with severe disabilities cope with the financial demands of their daily care. The severity and duration of disability may be unpredictable, and ElderShield helps to prepare us for such events by providing monthly cash payouts of $300 or $400 for 60 or 72 months upon diagnosis of severe disability. While you will not be excluded from ElderShield if you have pre-existing illnesses (eg. diabetes, high blood pressure) at the point of auto-enrolment, pre-existing severe disabilities will not be covered. The two insurance schemes serve different purposes. 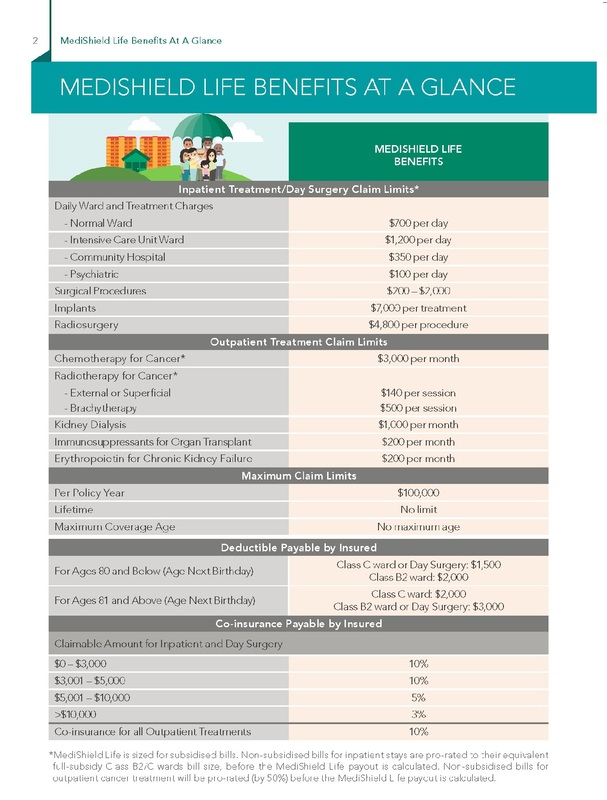 MediShield Life helps to pay for large hospital bills and selected costly outpatient treatments, while ElderShield provides monthly cash payouts to the insured in the event of a severe disability. Premiums for both MediShield Life and ElderShield can be paid from your Medisave account. It’s not enough to just know that you are being covered by certain insurance policies, you need to understand how much coverage it provides you. Understanding MediShield Life, which is an insurance policy that all of us have, can be a good place to start. Coverage for MediShield Life is pegged to costs in Class B2/C wards in public hospitals. What that means is that if you require hospitalisation and stay in either a Class B2/C ward, MediShield Life would cover most of the hospitalisation expenses, less the deductible and co-insurance component. A detailed breakdown on the coverage provided by MediShield Life can be seen in the infographic below. A common misconception that people sometimes have is that MediShield Life does not provide any coverage if they are warded in A/B1 wards or in private hospitals. This is not true. Coverage is provided but payouts would appear lower in comparison to the overall bill as they are based on costs pegged to Class B2/C wards in public hospitals. For enhanced coverage in higher-class wards and in private hospitals, you may wish to consider a private Integrated Shield Plan. As MediShield Life is a component of the Integrated Shield Plan coverage, there is no duplicate coverage between MediShield Life and Integrated Shield Plans. In an ideal world, we would want to have as many health insurance policies as possible with the best possible coverage that we can buy. However, we live in a real world where we have to manage between what we want against what we can afford. This gets trickier for healthcare insurance since we not only have to look at our affordability today, but our future affordability as well. Get a trusted insurance agent to work out with you an optimal coverage based on your financial liabilities, dependents and lifestyle. Once that is worked out, ensure that you compare it against your income so that it represents just a small percentage of your overall income. Work with your agent to cut down on excess if you find that the cost of health insurance coverage is too high. A good agent should not only take into consideration the cost of your insurance policies today, but also future increases. This is especially relevant for private Integrated Shield Plans, which would see a much steeper increase in premiums than MediShield Life, as one grows older. One area that most people don’t know about is the MediShield Life premium rebate. The premium rebates is designed such that younger Singaporeans who pre-pay more during their working ages will be able to enjoy higher premium rebates when they are older, from the age of 66. 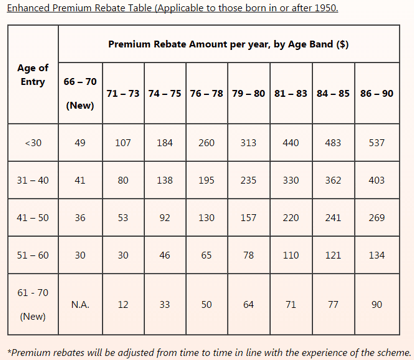 The table below shows how much premium rebates one can expect. In addition to premium rebates, it’s worth noting that there are also other subsidies available for the lower-income group. It’s important to remember that healthcare needs are not the only area that you need to plan for. Other important financial goals such as investing, retirement planning and saving cannot be ignored as well. Whatever amount of money you put into one area would mean less for other areas. As such, your financial plan should encompass all areas of personal finance. Set your goals for each area and work out how much you need each month in order to attain your goals. These goals should include your savings goal, retirement goal, investing goals and any other big-ticket items that you are working towards. Once you’ve done that, check if your monthly earnings after expenditure are sufficient for these goals. If the answer is “yes”, then great, work towards it. If the answer is “no”, then you need to rework your budget and goals such that they are attainable. Review this each time you get a raise or when circumstances change so that you can adjust your plan accordingly. To conclude, it’s important for us to recognise that having the right health insurance policies in place is important for our personal financial planning. At the same time, its importance does not translate into us simply buying any insurance policies our agents push. If you need more information about MediShield Life and Integrated Shield Plans, head to the MediShield Life roadshow from 11am to 6pm on 25 February 2017 at the Toa Payoh HDB Hub Mall. The post 5 Ways Singaporeans Can Avoid Overspending On Health Insurance appeared first on DollarsAndSense.sg.